Today Mayor Tom Henry held a press conference at the Grand Wayne Center to announce the third-annual Groundhog Open. This indoor golf tournament will take place on Thursday, February 6th, 2014 and is part of the Downtown Improvement District’s efforts to raise funds for the beautification of our fair city with all proceeds going to the year-round Downtown Flower Planter Program. 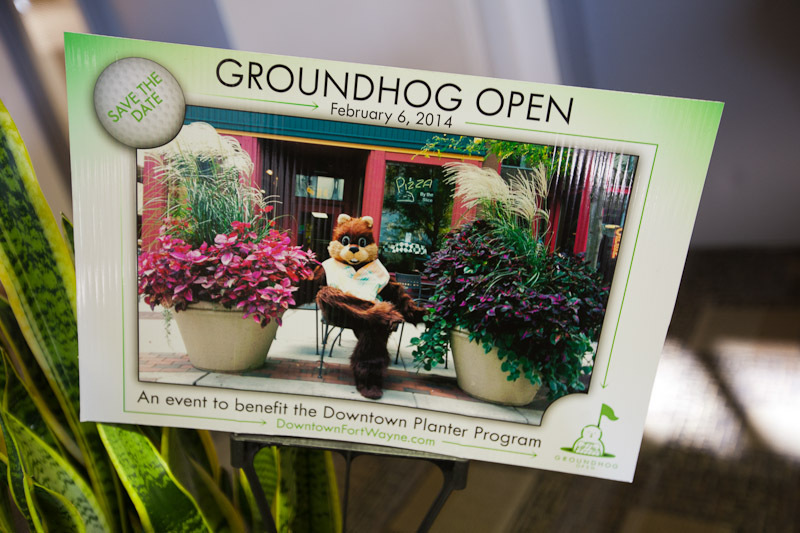 The Groundhog Open is an 18-hole championship indoor putting course laid out between the Hilton Hotel, the Grand Wayne Convention Center, the Embassy Theatre/Indiana Hotel, and the Courtyard by Marriott, as well as through the skywalks linking the buildings. Designed by sponsors of each individual hole, this extraordinary layout, crossing Jefferson Boulevard and Harrison Street will challenge even the most skilled golfer. Coordinated by a team of downtown volunteers including Deputy Mayor Karl Bandemer, Asher Agency, and Design Collaborative major event sponsors include Comcast and Fort Wayne Newspapers Northern Indiana Golf Show. The press conference was attended by media representatives alongside a miniature dancing groundhog. A friendly warm up competition hole was attempted by the Mayor and those present. Registration for the actual event is available at www.GroundhogOpen.com or call Jane Applegate at (260) 348-0218. For all of the photos from the press release, visit our Facebook album here.